Many people travel to relatives' homes for the holidays, so Christmas vacation packages can be a great deal. Crowds will be smaller and prices can be much more affordable. Here are some ideas for enjoyable Christmas travel. For a perfect getaway during the holidays, consider a cruise. You will escape the cold weather and shopping hassles to relax on board. Cruising at the holidays doesn't mean you will have to forego the seasonal festivities. Cruise lines go all out at the holidays to make the experience festive. You'll find decorations, holiday parties, and visit from Santa. Cruise lines also include religious observances and special holiday meals with all the trimmings. Besides the Christmas activities on board, you may find special activities in your ports of call. From mid-December to early January, it's carnival time in St. Kitts in the West Indies. Other destinations may be closed for the holiday, but you will be able to enjoy the decorations and holiday observances. Holiday cruises may be more expensive to some locations. If you package your trip with your airline reservations, you may, however, save greatly in the long run. For the best prices and cabin selection, book in advance. A white Christmas can also mean good skiing conditions. Book a holiday ski package and enjoy the skiing and the local activities. Santa Fe, New Mexico, for example, offers great skiing at the Sangre de Cristo Mountains just 16 miles away. You are also close to skiing in Taos, just 90 miles away. 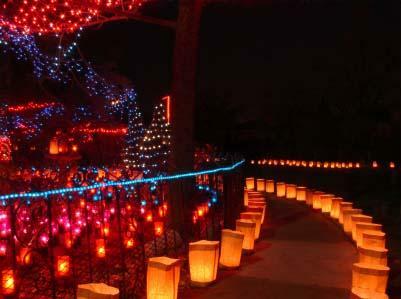 For the holidays, Santa Fe goes all out. The town is decorated with farolitos, also know as luminarias, which are brown bags filled with sand and a lighted candle. Santa Fe is full of traditional Mexican holiday festivities, such as the Las Posadas, the procession commemorating Mary and Joseph's arrival at the inn. The Christmas Eve on the Plaza is another popular seasonal event, complete with music and caroling. Santa Fe is also know for its cultural activities, Check the seasonal offerings at the Santa Fe Opera House or the Santa Fe Symphony. You'll also find special holiday menus and events at the hotels. Las Vegas is known for its bright lights and extravaganzas, but at Christmas, Las Vegas gets brighter and merrier. The decorations both outside the major hotels and inside are abundant and lush. If you enjoy viewing the lights, be sure to visit Caesar's Palace, with its lighted tree display or the light show at the Fremont Street Experience. The Bellagio becomes a wonderland of stunning decorations, definitely worth a visit. The Vegas shows are in a holiday mood as well. Las Vegas regulars, such as Wayne Newton, put on special Christmas shows. You'll also find holiday extravaganzas in the hotels. You'll find many affordable Christmas vacation packages for Las Vegas. Check for great package deals wither through the hotels or through the airlines. Theme Parks: Crowds are usually smaller at theme parks during Christmas as compared to the summer. You'll find special events planned for the holiday that will make it memorable and affordable. Hawaii: You can enjoy the war beaches and the distinctive cultural celebration with a Hawaiian Christmas package. Mexico: Mexico's tropical climate, beautiful beaches and colorful Christmas traditions make a great destination for the holiday.